I am not doing well. I am spent. I am drained. And now we are entering the season of giving? Ladies, I don’t know about you, but I am tapped out. I’m a mom of two boys- two and four. They are brilliant little crazed monkey lunatics. My heart is on my sleeve and in my throat every minute of the day. It’s exhausting. Strangers see my tight face in the grocery store as my boys have a screaming match in aisle 9, and offer me “These are the days! You don’t want to miss them!” Seriously? Cause I gotta tell ya, if I ever have a moment to myself I am daydreaming about dropping them both off at a highly-rated Charter school with after hour yoga care while I, I don’t know, take a hike or finish reading a paragraph in a magazine or simply do the dishes without someone clinging to my leg or wiping their nose on my jeans. I’m also gut-wrenchingly sad about this election. I know, I know, it’s politics and I should keep this clean, but man, my girl did not win and it hurts. And the more I hear the news it burns. It’s over. It’s done. And it did not go my way. Oh, yeah, and I’m having a mid-life crisis, did I mention that? Oh, and my mom hasn’t been well. Oh, and I need a job. And a break. Did I mention I was exhausted? The thing is, I live for this time of year. I love it. All the gifting. And the Santas packed in their Mazdas rushing off to the mall. I love the cookies (oh, the cookies) and the hob nobs and the twinkly lights and the jolly music and the fake snow- I mean, it’s my jam. But this year…this year, it’s feeling hard to gear up. And if I see one more billboard or catalog or commercial asking me to GIVE MORE this year- I may hurl. I just feel I give all day long. To my high-octane children. To my withering career. To my husband (seriously, are you sick again?). I don’t own a single second to myself. I don’t have a dime for a gift. My mind is mush and my body, now a toddler jungle gym, is banged up and bruised. And then it comes to me. As it usually does. In the shape of a mini-person, whose jaw line matches mine, with soft eyes and half the sandbox in his hair. Dishwasher stacked. Bath rinsed. Pee dried. Teeth brushed. PJs on. Brother “watched”. Alright. You win. I have exactly. One. Minute. I enter the boy’s bedroom and there it is. The night sky projected in my two-bedroom apartment. My son laid out every blanket on the floor (why-did-you-have-to-take-out-every-single-blanket-it’s-bedtime-not-to-mention-filthy-on-this…). Pillows were arranged. A barely working starry nighttime turtle lit up the ceiling along with every glow in the dark sticker he could find. He made this. For me. For us. And I almost missed it. I laid down on his Thomas the Train comforter and scooped up one boy under each arm. The little one stopped squirming and snuggled into my overheated body. The older acted as ringmaster –getting up to adjust the dimmer switch or to rearrange some IKEA light up animals, but then he rested beside me, head on my shoulder. And we looked up at our imaginary sky. And it was quiet. For a solid four and a half minutes. I didn’t have to give. I just had to give in. My boy kissed me on the cheek and said “thank you for stargazing with me, Momma” and for that, I could have cried for a year for a million reasons. One being, that he actually used “thank you” in a sentence. And one, that I almost missed this. I am wound so tightly these days. My nerves are shot and my patience is thin. And I am working so damn hard on keeping it together that I say “no” a lot to my kids. Or “I can’t” or “not right now”. I interrupt without letting them finish. I look at Facebook to tune out when they’re eating. I’d rather do the dishes or wipe the floor than take a moment to exhale because if I did- the unpredictable might happen- and I’m not sure if I could handle being out of control right this second. This month, instead of focusing on what I can give, I am going to try to give in. To the noise in my apartment. To the clutter. To the mayhem. And say “yes”, a little more often. Cause these are the days, after all. And I don’t want to miss them. Thank you, Ericka, for sharing your story as well the gorgeous photos of your boys! I've been elbows deep in holiday cooking and am sharing 2 of my favorite recipe for sweet treats. Preheat the oven to 225 degrees F (110 degrees C). Line cookie sheets with aluminum foil or parchment paper. In a large glass or metal bowl, whip egg whites, vinegar, and salt to soft peaks. Gradually add sugar while continuing to whip until stiff peaks form, about 5 minutes. Add the peppermint extract whipping for 15 more seconds. Paint a vertical stripe on the inside of the piping bag from top to bottom. 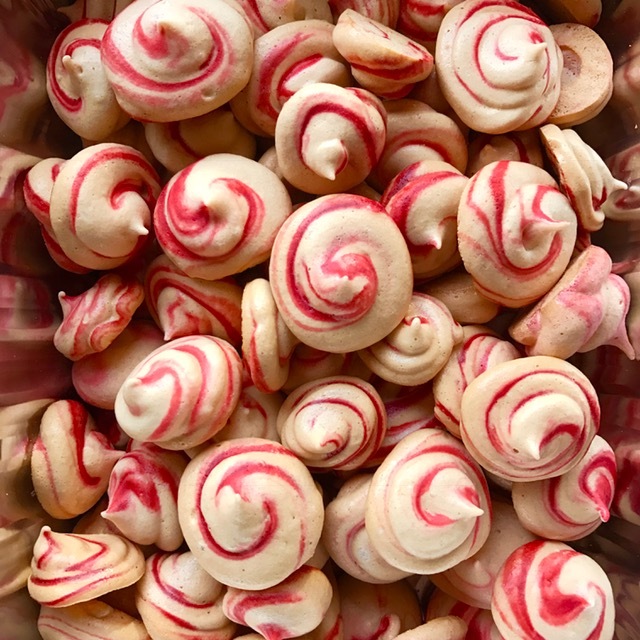 Fill the bag with meringue, and pipe small circular shapes (they don't need to be perfect rounds) 1 inches apart on parchment-lined baking sheets. As you finish piping each shape, apply less pressure to the pastry bag, and swirl the tip off in a circular motion. Bake meringues until crisp on the outside but still soft inside, about 1 hour 15 minutes. Let cool completely on a wire rack. Position 1 rack in top third and 1 rack in bottom third of oven; preheat to 350°F. Line 2 baking sheets with parchment paper. Whisk flour, crystallized ginger, baking soda, and 1/4 teaspoon salt in medium bowl. Using electric mixer, beat butter in large bowl until creamy and light, about 2 minutes. Gradually beat in both brown sugars. Beat on medium-high speed until creamy, about 3 minutes. Add egg, molasses, fresh ginger, ground ginger, cinnamon, and cloves. Beat to blend. Add flour mixture in 2 additions, beating on low speed just to blend between additions. Place 1/3 cup sugar in small bowl. Measure 1 tablespoon dough. Roll into ball between palms of hands, then roll in sugar in bowl to coat; place on baking sheet. Repeat with remaining cookie dough, spacing cookies 1 1/2 to 2 inches apart. Bake cookies until surfaces crack and cookies are firm around edges but still slightly soft in center, about 15 minutes. Cool completely on sheets on rack. DO AHEAD: Cookies can be made up to 4 days ahead. Store in airtight containers at room temperature.